And yet where does the man who’s lyrics go “I’m rich and you’re poor / I’m beautiful and you’re ugly” dine when he’s in NYC? Bubba Gump Shrimp Co. (actual quote: “Damnn, bro, Bubba Gump!). Maybe it’s a nod to his humble origins: Swagg says he was homeless for a while and did a few years in the clink on drug and weapons charges, though he insists his riches come from legit business. The nature of that business is a mystery: he doesn’t seem to have a record deal or any U.S. press, but somehow he has over 36,000 Twitter followers. The more we learn about Swagg Man, the more convinced we become that he’s the most absurd human being alive. Here’s why. 1. 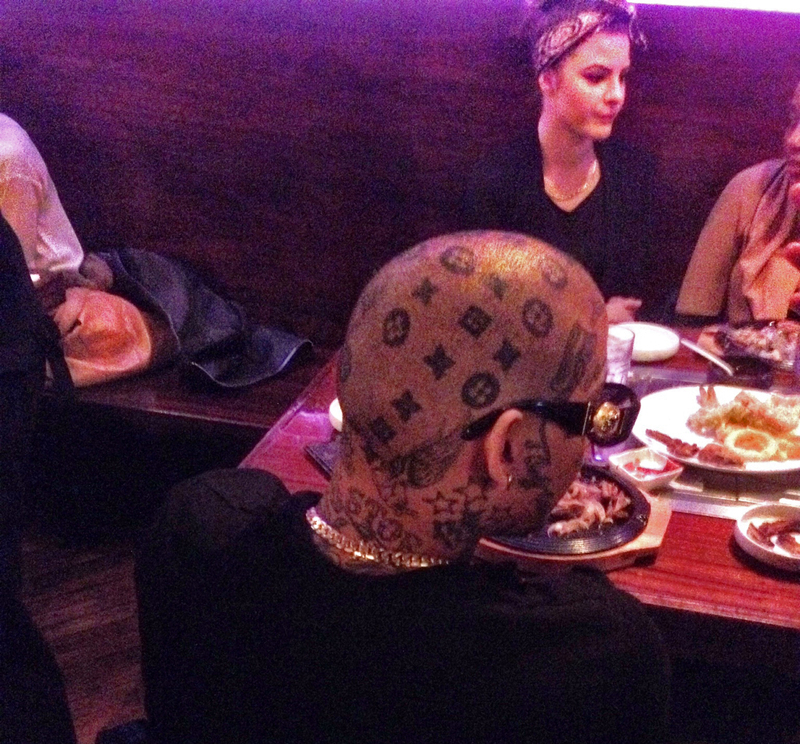 He filmed himself getting a Louis Vuitton head tattoo. 3. He taunts “haterzzz” by burning money and then filming his Louis Vuitton gear (including his man purse) for 5 minutes straight. 5. He uses the n-word liberally while licking the bottom of his Air Jordans. 7. On Facebook, he shows off his Reebok Pumps one second and his Louis Vuitton guns the next. 9. He picks his nose and then flicks the booger onto a gilded Lamborghini necklace. 10. He pens love letters to (and gets bitchslapped by) his pitbull, Swaggy Doggy. 11. This is how he hash-tags pretty much all of his posts. 13. And yet French girls mistake him for Lil Wayne. What an imbecile. Please don’t give space to this sad individuals.